You may receive updates from U.S. Department of Arts and Culture, the sponsor of this form. WATCH THE RECORDING OF THIS FEB 22, 2017 CITIZEN ARTIST SALON. 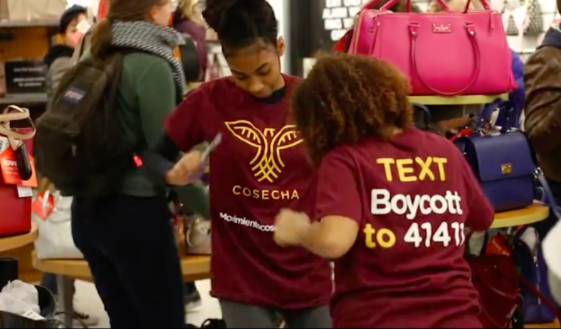 Ever heard of #SalsaShutDowns to boycott companies with exploitative labor practices? How about NewYorkTlan, an indigenous language and cultural festival that reunites families from both sides of the border? Wondering how you can bring your creativity to the fight for immigrant rights? Nataly Castaño, artist and cultural organizer with Cosecha, a nonviolent movement working to win permanent protection, dignity and respect for the 11 million undocumented people in this country. Marco Antonio Castillo, organizer and director of the Asamblea Popular de Familias Migrantes, building people-power and reuniting families across borders through innovative cultural programming. Sonia Guiñansaca, migrant artist and cultural organizer, and the Operations Manager at CultureStrike, a national network of socially engaged cultural workers and artists of color doing work at the intersection of arts and social justice. In a moment that calls for profound resilience, resistance, and imagination rooted in culture, join us for inspiring stories of how la cultura cura. Learn how you can bring your energy and creativity to the fight for immigrant rights. Moderated by Adam Horowitz, USDAC Chief Instigator. **USDAC Citizen Artist Salons are online, video-based gatherings and learning calls that deepen dialogue on specific themes and allow promising projects, ideas, and possibilities to circulate throughout the USDAC network. Each Citizen Artist Salon features guest presenters, open space for group conversation. and highlights opportunities for action and connection across the USDAC Network.